A very scary monster with wild and weird fur and grubby, un-brushed teeth spends his time frightening the animals that live in the forest. That is until one day he gets the hiccups and, try as he might, just can’t shake them off. In desperation the monster begins to cry and takes advice from the animals he has previously terrified – he tries all their remedies from standing on his head to holding his breath but to no avail, until the animals come up with an ingenious way of scaring the hiccups away – they show him his own reflection! 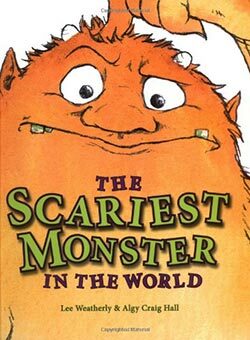 The illustrations in this book feature a goofy rather than truly scary monster, alongside a cast of cute animals and an awful lot of hiccuping! This is a great book for sharing and is sure to tickle the funny bones of those who read it!